The MetaTrader4 platform, popularly called the MT4 platform, is a retail forex trading platform designed by Metaquotes Inc as a turnkey solution, available for individual market maker brokers to customize and offer to their clients according to their branding requirements. This platform has been hailed as a revolutionary platform in the retail forex trading space. It is so popular that traders generally refused to adopt the MetaTrader5, which was supposed to be an improved version of the trading software. In response, Metaquotes Inc had to take some features of the MT5 to build a brand new integrated MT4 platform. The new platform which started at Build 600, currently operates at Build 900, offering traders the opportunity to trade forex manually or with automated trading software. Nearly every retail forex broker now offers the MT4 platform. Even brokers who started out with proprietary software were forced for marketing reasons to adopt the MT4 as an alternative to their proprietary trading software. MT4 Multi-trader, used in trading multiple accounts and built specifically for portfolio managers. MT4 Webtrader, which is a web-based version of the MT4. This version is traditionally lighter and only requires the platform’s URL, the trading account username and password to gain trading access. MT4 for iOs devices, which works for the iPad and iPhone. MT4 Android OS version, which is used for Android phones and tablets. There is also a version for the BlackBerry, but this is not commonly offered. The MT4 for mobile versions can be downloaded from the respective app stores (Google Play for Android and App Store for iOs devices). However, this must be done from a link pasted on your broker’s website so you are sure you are downloading your broker’s version of the MT4. The road to trading with the MT4 actually starts with the broker selection. You can call this the preliminary step. The MT4 is designed to be a turnkey solution for brokers. This means that any broker can apply to Metaquotes for customization of the MT4 platform according to their branding requirements. Therefore, what you get on the MT4 platform of one broker may not be the same as what is obtainable with another broker. There are differences in assets listed for trading as well as differences in contract specifications. So you really cannot download just any MT4 for use. You must download the MT4 custom-made for the broker you want to trade with. Brokers usually require the trader to fill an online account opening form in order to get access to the download links for the MT4 platform. The same MT4 platform can be used to trade in a virtual mode as well as in a real money mode. 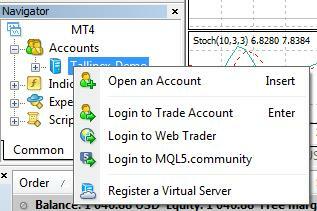 The first step is to download the MT4 from your broker’s webpage if you want to use the desktop client. It is advisable to start your learning process of how to use and trade with the MT4 from the desktop client. You can also get access to the MT4 using the web-based client and you can also download the mobile apps from the respective app stores. However, all downloads must be done from your preferred broker’s site. The MT4 Desktop Client download has changed somewhat with the introduction of the new MT4 platform which commenced from Build 600. Previously, an executable file of about 4.6MB was all that needed to be downloaded, after which the file could be installed immediately. Installation after download did not require an internet connection. But when the new MT4 was launched, the download format changed. A light file is downloaded, and then the setup process which causes the heavier components of the file to be downloaded over the internet is initiated. This creates a desktop client which is much heavier than the previous pre-build 600 versions. Once the MT4 client is downloaded, you are set to start trading. The demo account will usually be the trader’s first interaction with the trading platform. A demo account allows you to try out the entire process of forex trading with the MT4 before committing real money into a live account. Opening a demo account can be done in two ways. It can be done directly from the broker’s website using the online form filled earlier to obtain the link to the MT4 download. Usually the broker will send you your login details along with the download link via email once you have completed the form. 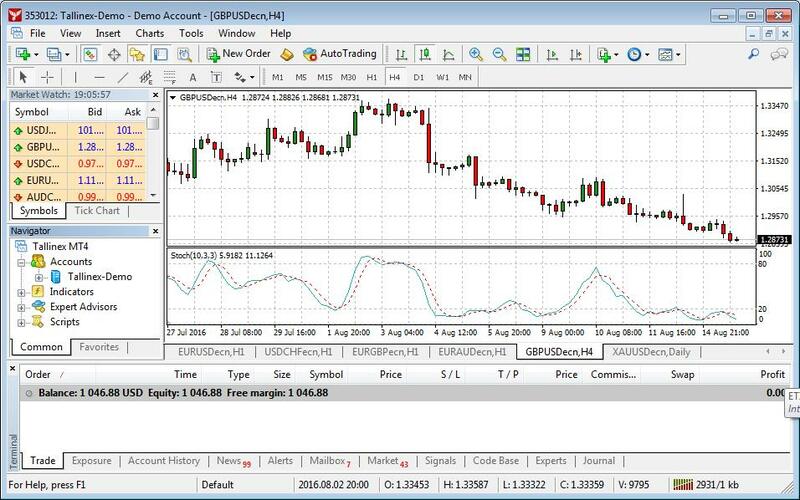 Additional demo accounts can be created directly from the MT4 platform by right-clicking “Accounts” on the Navigator window on the left-side of the platform interface. To open the demo account from the trading platform, you have to go to the Navigator Window on the left hand side of the platform, or you can simply the keyboard shortcut Ctrl + N to open the window. 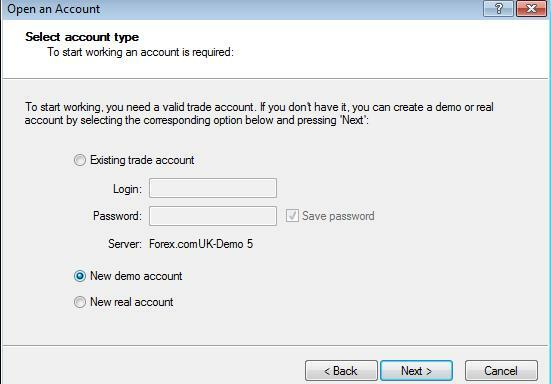 When this is done, a pop-up window will open to indicate the available demo account servers for your broker. You can select the server of choice by simply highlighting the server bar. Then click “Next” to create the login profile. Another pop-up window will open prompting the trader with the option of either adding a new demo account or an existing account. Check on the Click on the “new demo account” option, then click the “Next” button. This action will lead the platform to generate a demo account number and password which can be used to login to the demo trading account. By default, the platform sets the option to remember the login details, so that when the platform is restarted, the demo account becomes active immediately without the trader having to login to the platform. You are expected to use the demo account to learn how to place orders, how to navigate around the platform, popular MT4 shortcuts and other functions used for trading such as charts and indicators. You can only open a live account from the account opening page of your broker. This requires filling a more comprehensive account opening form that will require submission of sensitive information about the trader. Furthermore, documents to prove identity and place of residence must be submitted for scrutiny before the live account can be activated. When the details are all submitted and the account is approved, the trader will be sent the real account login details. After opening the MT4 platform, the trader has to follow the process of opening a demo account from the platform, up to the point where the options to enter the account details are provided. 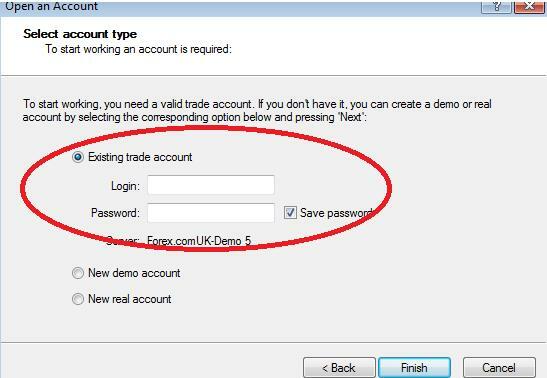 Here, the trader should click on the “Existing trade account” radio button, then enter the real account details before completing the process by clicking on the “Finish” button. The server must also be changed from the demo account server to the real account server. This can be done pressing Ctrl + O, and selecting the appropriate server in the “Server” text box. Trading with the MT4 cannot be said to have commenced if there are no funds in the trader’s account to commence trading. The trader must deposit funds with the broker using any of the transaction methods listed on the broker’s account page. When transfer of funds is completed, the transferred amount shows up as the free margin/equity in the terminal window located at the bottom of the MT4 interface. Using the Trade Panel (1st route on chart) or clicking Alt + T.
Clicking the F9 button on your computer keyboard. Clicking the New Order tab located at the top of the MT4 interface (2nd route). Right-click on the chart, then select Trading -> New Order. When this is done, a pop-up window opens and prompts you to set parameters for the trade such as the stop loss, take profit, lot size, etc. You can then choose the method of trade execution. This is done using market orders (buy or sell) or pending orders (Buy Limit, Sell Stop, Buy Stop or Sell Limit). An explanation of these order types will be done in a subsequent article.